This soup was such a favorite at ROXY’S BISTRO we would make gallons every week. It’s a great soup because you can make twelve months of the year. There are two important elements. You use canned tomatoes(but you must use top quality Italian canned whole tomatoes). The chicken stock should be a rich, flavourful home-made stock. In a large pan, over medium heat saute the onions with a good sprinkle of salt, more grinds of black pepper than you think you need, and around 1/2 tsp red pepper flakes. When the onions become translucent (don’t brown them please) add the chopped garlic and saute for a couple of minutes more. Put this onion mixture into a large sauce pan. 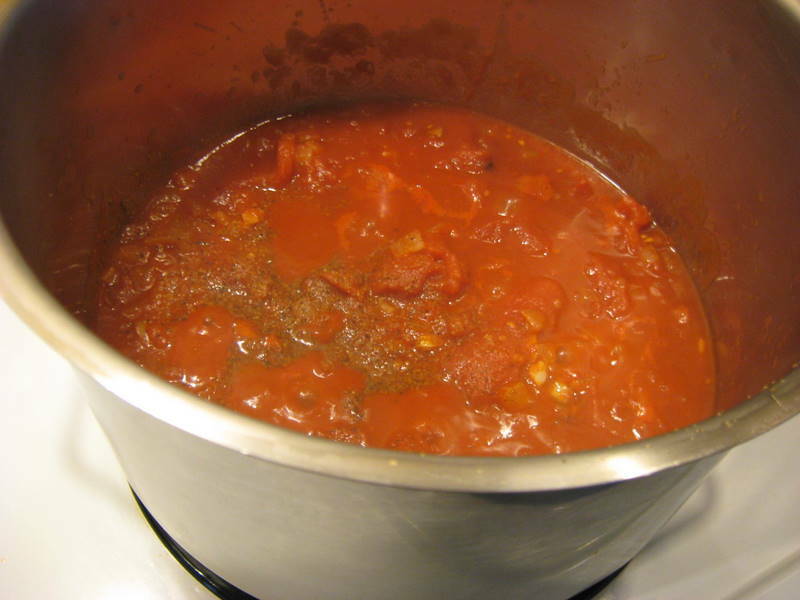 Add the basil and oregano, canned tomatoes and the tomato paste and turn your heat to simmer. Let this cook away while you are preparing the roux. In a medium sized saucepan melt the butter. Now add the flour and cook the flour for a few minutes. Use a wooden spoon to mix the flour as it cooks. Increase the heat a little. Add the chicken stock and using a balloon whisk stir the sauce until it thickens. Make sure your sauce is lovely and smooth with no lumps. Add the sauce to the tomato mixture and still well. Now add the cream. Mix well and pour into your soup bowls. Garnish with a spoonful of sour cream and fresh basil or flat leaf parley. Bon Appétit!! This soup was such a favorite at ROXY'S BISTRO we would make gallons every week. It's a great soup because you can make twelve months of the year. There are two important elements. You use canned tomatoes(but you must use top quality Italian canned whole tomatoes). The chicken stock should be a rich, flavourful home-made stock. In a large pan, over medium heat saute the onions with a good sprinkle of salt, more grinds of black pepper than you think you need, and around ½ tsp red pepper flakes. When the onions become translucent (don't brown them please) add the chopped garlic and saute for a couple of minutes more. 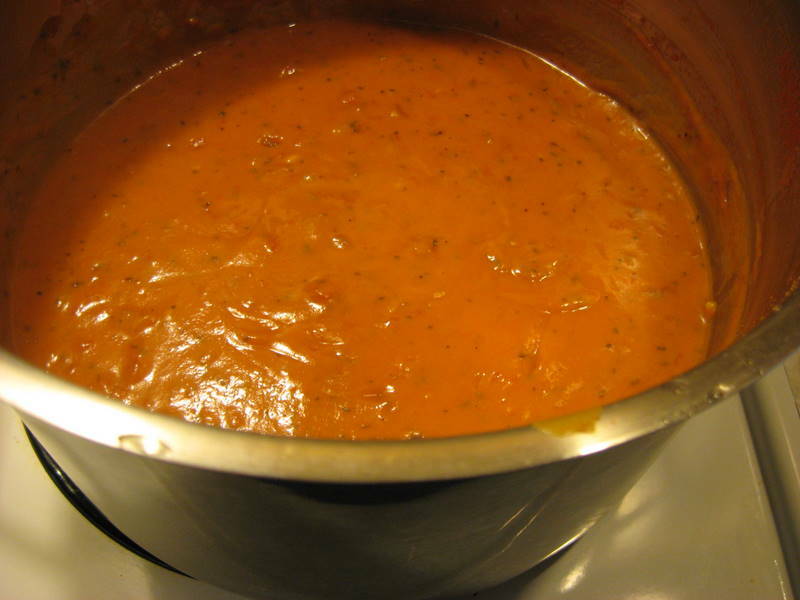 This entry was posted in Soups and tagged Basil tomato soup, comfort food, Roxy's Bistro, tomato basil soup, Tomato soup. Bookmark the permalink. Love your website and recipes! How much cream do you add to this recipe? Or is it just a generous dollop at the end? Thank you! How wonderful to have you in my kitchen Myree. I like putting a generous dollop at the end. I even pass a bowl of sour cream along with the soup just in case my guests like to indulge. And I do so like to indulge my friends and family in the kitchen. Enjoy! !